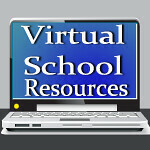 Virtual School Resources: Virtual Homeschool Convention & Freebies! I love homeschool conventions, but would prefer not to have to get there, walk a half mile after parking, and have all my goodies mailed to me. Sound too good to be true? Go here http://bit.ly/FP4oW6 to attend the Virtual Homeschool Convention today! There's a "tote bag" freebie from Knowledge Quest, one of my favorite History curriculum companies. You'll also find curriculum reviews for every subject, and a lot more giveaways. Just register and browse around. I'm already thinking about what to do in the fall. Take a few minutes and check it out!